Have you been able to tell that I'm seriously loving having a Disneyland pass again? Well, I am. I've been having an absolute blast going about once a week after work, and it's been so much fun feeling that infamous Disney joy on a regular basis. The best parts of having a pass: 1. 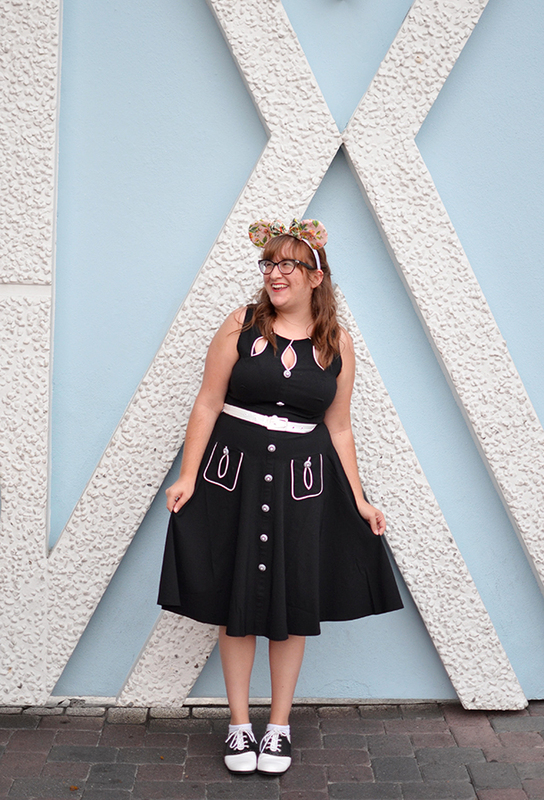 I don't feel the pressure to go on every ride each time I'm there because I can come back whenever I want and 2. it opens up an entirely new facet of my blogging/outfit photo hobby. So many new locations to take photos at, new themes to plan outfits around, accessories to buy... it's exciting! If there's one way I think I've grown in the past year or so, it's learning to not be embarrassed by this hobby. I've spent a lot of time in my five years of blogging acting sheepish about taking photos and apologizing to the people I'm with. When it comes down to it, it's a silly thing to do, but it's also my favorite. I love planning shoots and learning about photography and what kind of aesthetic I like. I've done a lot better at owning up to the fact that this is something I enjoy and not a thing to be embarrassed by, but this weekend really drove that point home for me. For starters, I went to the Museum of Ice Cream on Saturday with Erica. I have a dedicated blog post coming this week so I won't elaborate too much just yet, but the entire museum was filled with people trying to get the right Instagram shots. At Disneyland, I started to notice more than ever just how many spots had lines of people waiting to taking photos. What I'm trying to say is that, well, we're all doing it. It's silly and self-indulgent, but you know what? It's fun. And though I used to be convinced of it, no one is judging me. They're all just waiting to get their own perfect shots. In a way, it's just another lesson that Disneyland taught me. That and, always double check that they put alcohol in your drink because I'm pretty sure my Spine Chilling Lemonade did NOT have vodka in it even though I paid for the alcoholic version. You win some, you lose some. 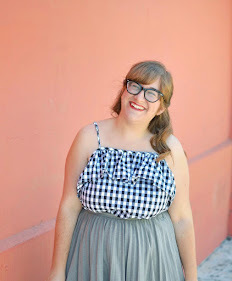 I'm genuinely curious, how many of you have also had to deal with learning to not be embarrassed about style blogging? Or did you naturally have no shame about it from the beginning? I was thrilled to bust out this dress yesterday for the first time. Despite the fact that I've been drawn to bright colors lately, this black Voodoo Vixen dress caught my eye recently, and I couldn't stop thinking about it. 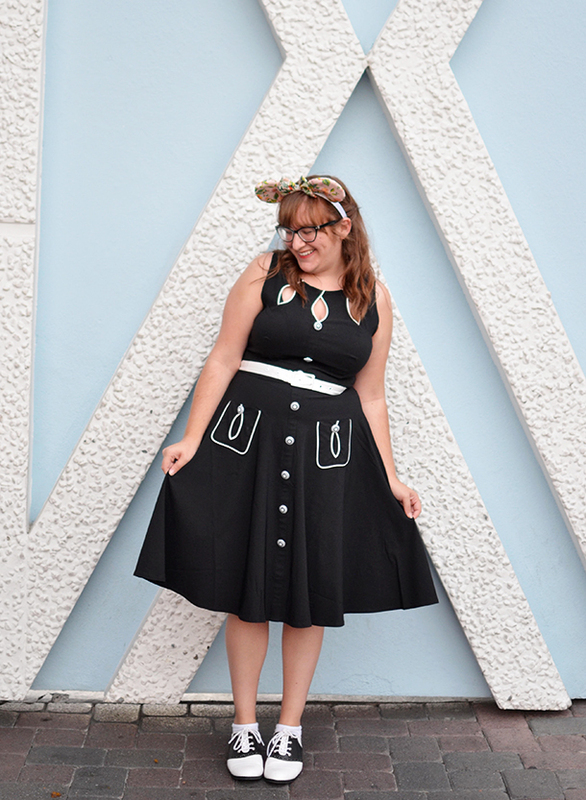 I got a Unique Vintage gift card last week, and I looked at just about every single dress on the site, but I kept coming back to this one. The material is much stretchier than I had expected so I think I might have been better off sizing down, but it's not nearly noticeable enough to return it. If you're short like me, you may want to consider doing so as I kept having to pull it down in the back so it wasn't too large in the shoulders, but it was still comfortable enough. It's super breathable, and it ended up being great for a long day at the parks. 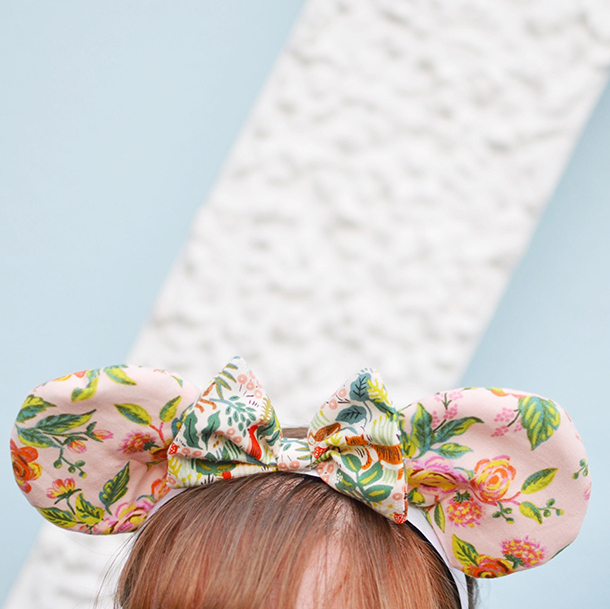 The best part of this outfit though has to be the ears. Erica made them for me when I showed her a pair made out of Rifle Paper Co. fabric that I wanted to buy. 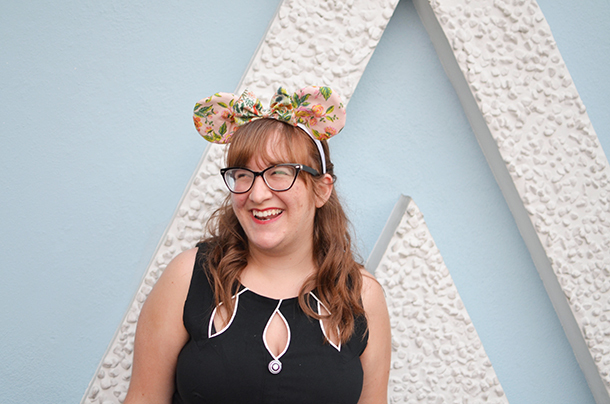 I got the fabric for a fraction of the price as the ears I had seen, and Erica was a true angel and made them for me. Don't they look amazing? I'm going to wear them All. The. Time. 1) First things first, I've always loved seeing this dress, but your post here is the first I can really apperciate all the details of it, since you took such a great photo of it. I can see the buttons are pearled! How cool! 2) Such a thoughtful response on a topic that is clearly one that weighs on every blogger's mind. Being embarassed about some aspect of the hobby (which is funny because, with the exception of sports fanatics and maybe people who are in 70 book clubs, I think everyone is a bit embarrassed about their hobby. And sports fanatac have been known to paint their bodies and go out into freezing weather so....) For me, I think the fact aht I spend time thinking about clothes is embarassing on a professional level. Like, I was really mortified that someone in the interview room knew and mentioned that I blogged. They were even mentioning it a a positive, like, "Look, here's a person who knows about The Internets." No one else even knew what blogging was at that point (circa 2012), lol. But you know what? While I still don't advertize it because a small town + being a teacher can mean everyone feels your business is their business, I feel entitled to own that it is something I like. Good on you for coming to that conclusion. 3) Also- what interesting points about everyone taking photos now a days. I read that despite all the gloomy predictions that people weren't living int he moment, that taking photos actually increases happiness both in the moment and then later, because you can look back at the photos and relive that moment. So happy to see those ears on your head! Honestly, I don't think I'll ever get over the weirdness of taking photos in public. At least not completely. i mostly just feel awkward. So I just try to be quick about it haha. It does help to be around someone else who doesn't care (like you! ), but the awkwardness is intensified if I'm with someone who feels even weirder about it than I do.